Nuvo whole home audio is a wired and wireless distributed audio solution that is designed to match the newest technology with ease of install and use. 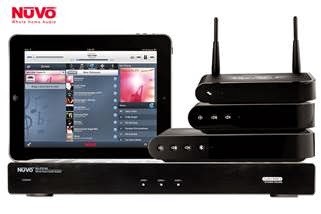 Streaming wireless sources as well as traditional audio input methods are completely supported and reliable with the highest quality output. The Nuvo Wireless Audio system begins with a Wireless Gateway (GW100) that allows the audio players in every zone (room or separated space) to communicate with each other, along with your other media devices to access music and stream audio from countless online options. It’s as easy as connecting the Gateway to your home internet network, and a Nuvo player to your favorite speakers. As you decide you would like to expand the system, simply add a player in another zone and you are up and running in no time. The Nuvo App (Apple and Android supported) allows you to control your system right from your phone or tablet without having to move! In an instant, you have your world of music right at your fingertips.